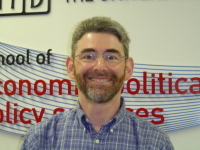 Dr. Kurt Beron is a professor in the School of Economic, Political and Policy Sciences at UT-Dallas and teaches in Economics. My research is in cross-disciplinary applications of quantitative methodology. I have worked on projects spanning economics, education, sports, sociology, and psychology, and my research has often focused on public policy issues. I have had a continuing interest in the public sector and its influence on individuals and institutions. My concern with this began during my work on my Masters in Social Work, which preceded my Ph.D. in Economics, and focused on social welfare policy. My current research agenda focuses on the human capital development of children and young adults and their effects on later outcomes, but emphasizes the traditionally non-economic factors that affect this development. My empirical work seeks the understanding of situations that involve unobservable and latent variables using econometric and statistical techniques such as qualitative and limited dependent variable models, structural equation modeling and multilevel and mixture (group-based) modeling. I have been the senior researcher through the Texas Schools Project on a Texas legislature-mandated value-added assessment of public schools and districts, previously under the sponsorship of the Texas Comptroller, and now through TXSmartSchools. In on-going, collaborative work on an NIH-funded grant I am a co-investigator investigating underlying causes of social and physical aggression of elementary through high school children. I am also the NSF Principal Investigator for the nine-institution consortium that forms the DFW Federal Statistical Research Data Center (FSRDC). In other work I am collaborating on estimating models relating to student-athlete success. I am the principal investigator on an analysis for the Dallas Central Appraisal District on the current condition of the residential housing market. Earlier research focused on education, hedonic pricing models, and tax compliance, and included research into the reasons behind various earnings patterns found among men and women and across races as well as neighborhood dynamics and external change in South Dallas. I have served on the editorial boards of Structural Equation Modeling: A Multidisciplinary Journal and Evaluation Review. I have been the Associate Dean and College Master for the School of Social Sciences at UTD and have chaired the University's Information Resources Committee and Committee on Educational Policy. I have published in The Review of Economics and Statistics, Southern Economic Journal, American Journal of Sociology, Structural Equation Modeling, Developmental Psychology, and Social Science Quarterly among others. I teach a wide range of courses including those in sports economics, public sector economics and econometrics. In addition to my regular faculty assignment in the School of Economic, Political and Policy Sciences, I was a member of the Global Leadership Executive MBA faculty for ten years. I also serve the University as the NCAA Faculty Athletics Representative (FAR). I am also the VP for Division III of the FAR Association and currently chair the NCAA association-wide Research Committee.